Mantra Of A Cynical Optimist. Always aim a lil bit higher than what you think you can get. Coz when you fail most of the time, it's already half expected, so meh. Either way, it's hard to argue with that kinda logic. Last Tuesday my sister and I received an email that Grandma Lau had entered hospital. At the time, we didn't think it was anything other than a standard checkup. Then on Friday night, my Dad phoned me at work to say her condition was much more serious than originally thought. Within the next three days, my sister flew back from Australia, Cousin Silas gathered up his entire family and flew back from HK within hours of receiving the call. I landed Wednesday morning at 7am. It was the first time the entire family had been together in one place, in one country in something like 5 years. My Grandma joined my Grandfather an hour after I landed. If Grandad Lau taught me the power of respect without words, the gift of being practical with my hands. 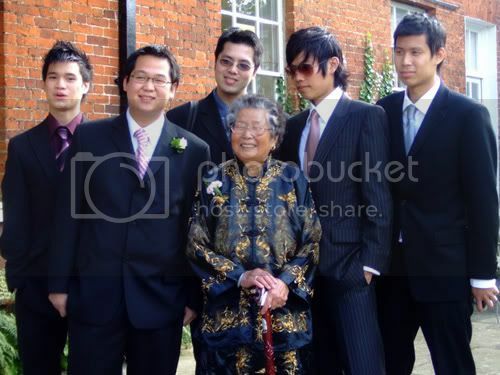 Grandma Lau was the one taught me the importance of being honest in my opinions, the gratitude of being surrounded by the most amazing family anyone could ever ask for. Now it's up to us to lead a life where she can be as proud of us as we are of her. She's dancing with my Grandfather now.